Access All Areas members have a fantastic new font to download this week, courtesy of Sam Parrett from Set Sail Studios. 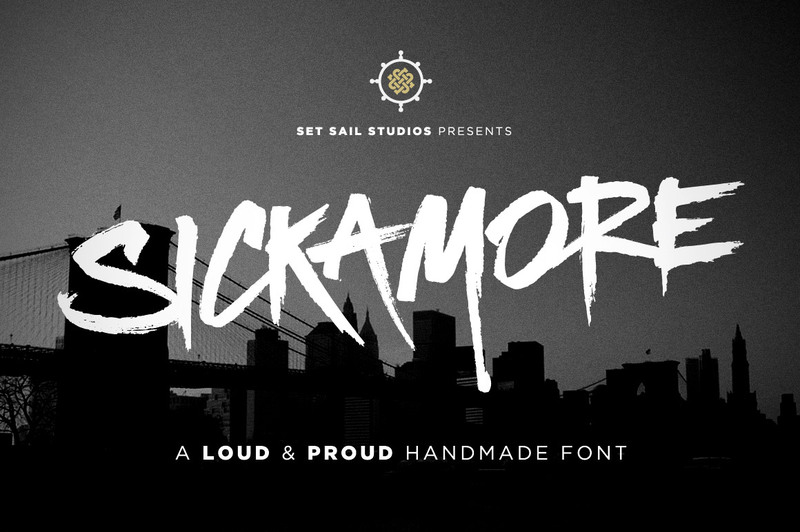 Sickamore is a loud and proud handmade brush font with a powerful and edgy style. It’s great for headers, logos and attention grabbing words or phrases. This is a font I’ve had in my personal collection for a while and has been a regular typeface choice for many of my own artworks, so I’m excited to team up with Sam and share it with my Access All Areas members. Sam Parrett is a UK based type designer and tea enthusiast who specialises in hand lettered font designs. He shares high quality digital resources for the creative community via his Set Sail Studios website and Creative Market store, which are packed full of expertly designed typefaces in a range of popular handmade styles with markers, pens and brushes. Sickamore is a rough brush font with lots of attitude! It comes as an all-caps character set with several alternate characters to eliminate any duplicate letters with the same appearance, along with numerals, basic punctuation and currency glyphs. ooh! Perfect slash for Halloween. Yes, it’s such a versatile font! Very, very nice! Thanks to you and Sam! I like the edgy style too! I’ve downloaded it and it works beautifully, but I can’t seem to figure out how to install it into Photoshop CS6 on Mac. Thanks again, you are a great individual, very giving and extremely generous. you rock it once again, Thank you and your wonderful site of magic. Thanks Diane! I like the font too!